Whether you’re suffering from a common cold, seasonal allergies or a more serious illness, such as pneumonia or bronchitis, the need for immediate and long-lasting cough suppression is immense. Unfortunately, many over-the-counter cough syrup medications are filled with a myriad of synthetic chemicals, which makes it an unappealing option for those wishing to minimize their exposure to these harsh compounds. However, what if you were to discover one of the most potent cough suppressant and anti-inflammatory compounds is found in your backyard? Pine needle cough syrup has quickly moved from the underbelly of natural remedies into the mainstream spotlight due to its potency in alleviating symptoms associated with post nasal drip and respiratory illnesses. The most impressive part? This medicine utilizes 100% natural and cheap and/or free ingredients, which makes it an ideal choice for those seeking to minimize their exposure to synthetic chemicals or when access to pharmaceuticals is unavailable, such as during a natural disaster or camping trip. Step One – Pour the water and pine needles into a pot and bring the water to a gentle boil. Allow the ingredients to boil for 10 minutes, or until the needles have turned brown and water has adopted a greenish-yellowish hue. Step Two – Strain the needles out of the water, and replace the water back into the pot. Step Three – Add the honey into pot, and bring the water to a boil. Continue to boil the ingredients until the liquid transforms into a syrup-like consistency. Step Four – Once the liquid has thickened, pour into a resealable glass jar and allow it to cool. Step Five – Consume 1 to 2 teaspoons as needed to control your cough and soothe throat and lung irritation. Refrigerate between uses. Pine trees adorn forests throughout the country, but did you know they offer more than natural privacy and year-round greenery? Pine needles are filled with antioxidants and antimicrobial properties, according to a study published in the July 2012 edition of the “Journal of Food Sciences.” For generations, pine needle tea has been consumed by indigenous peoples as a decongestant, expectorant and an antiseptic wash. In fact, pine needles have up to five times more vitamin C than freshly squeezed orange juice. 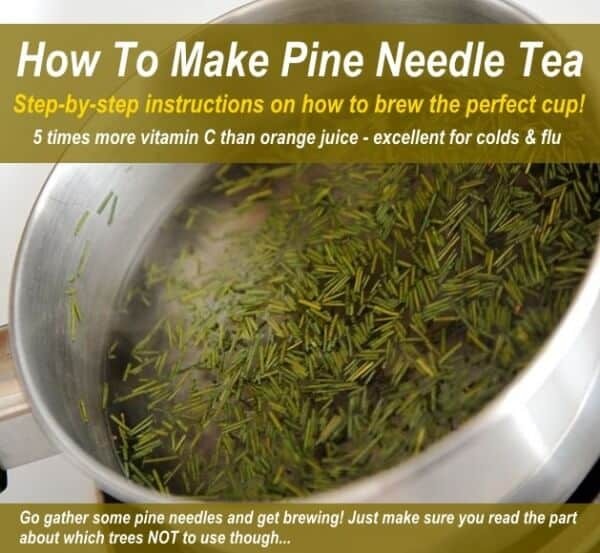 Enhance your health, while learning a new skill, by gathering and making pine needle tea. As a rule of thumb, the younger and greener the needles, the more concentrated its medicinal compounds. The ideal needles are less than three-inches long. Don’t choose needles from a pine that lines a roadway or in a highly-populated area as they may be sprayed with pesticides or other toxic chemicals. The best needles come from pines found deep in the forest. Put your hiking boots on and enjoy a day in the country while searching for healthy pine trees. Common Yew (Taxus) – Found in shrub or small tree sizes, Yew contains a toxic alkaloid known as taxine, which is fatal if consumed by humans. Norfolk Island Pin (Araucana Heterophylla) – Also referred to as the Australian Pine, this pine tree is often used as Christmas trees and small indoor plants. This plant is poisonous to humans and animals. Ponderosa Pine (Pinus Ponderosa – Also known as the Yellow Pine, is regarded harmful to humans. In fact, its needles are used to terminate animal pregnancies. Step 1 – Gather at least 1 cup of fresh pine needles. Thoroughly wash the needles with clean, cool water. Step 2 – Chop the needles into a small pieces. Make sure to remove any brown portions of the needle. Step 3 – Bring 3 cups of water to a rolling boil. Step 4 – Add needles to the water as soon as it starts to boil. Step 5 – Remove the saucepan from the heat source, and cover. Allow the tea to steep for at least 20 minutes. Increase tea potency by allowing the tea to steep overnight. This results in a deep, reddish-brown colour as a higher concentration of compounds were leached into the water.Step 6 – Pour the tea through a strainer to remove the pine needles. Step 7 – Sweeten the tea with honey or agave nectar. Some find freshly squeezed lemon enhances its flavour. The thing I don’t get is – they say simple things are always the best, but given how simple things are by nature, why don’t we all just think about doing it? For years I have struggled trying to reach apples from the top of our tree and not once did it ever occur to me to make one of these simple devices. This fruit picker has your apples and pears etc sorted. For plums and smaller tree fruit, just use a smaller soda bottle! Also for higher fruit, make up a longer handle. Making one of these DIY fruit pickers isn’t rocket science, but I highly recommend heading over to ‘Grit’ and checking out Alan’s great tutorial on how to make and use this genius, simple fruit picking device. All the outdoor and survival books, websites and magazines are always showing you which foods you can forage for and eat in the wild. Most of us have some knowledge of some core plants and fruits that are ok to eat, and we stick clear of plants we can’t identify. The thing is there are plants you can eat, plants you can’t eat, but there is also a third category – plants you think you can eat, but you can’t… These are the dangerous ones! Luckily Deane from Eat The Weeds has compiled a list of some of the most common plants in the US, that are often thought to be edible, but they are not. It’s well worth a read to check whether any of the plants you think are edible are on the list. Better to know now when you are sitting in front of your PC! If you have always thought about foraging for these mushrooms, but you never knew where to start, today’s your lucky day, as the link below contains an excellent tutorial on hunting for morel mushrooms. The best time to hunt for morels is from March to June, depending on where you live. Again depending on where you are located, you can find them earlier and later too, so it’s always worth a look. If you don’t find any, you still had a nice walk in the woods! You have probably seen pineapple weed thousands of times but never given it a second look. It likes yards and other trampled/beaten and unkempt areas. It is very easy to identify with its pineapple shaped yellow flower heads. It is actually a close relative the chamomile and it has similar calming/sedative properties. In fact I would say it is a more powerful sedative than chamomile. Pineapple tea is very simple to make and it tastes great, like a sweeter slightly pineapple version of chamomile tea. It is excellent to drink when stressed to help you relax. It is also great to drink before bed to help you sleep. You only use the flower heads to make the tea, so go out and collect around a handful (seems about the right amount for a decent sized cup). Make sure you collect from a clean and unpolluted area. Once you have your flower heads, simply put them in a cup, teapot or French press (French press works very well), cover with boiling water and let them sit and steep for 3-5 minutes. Now simply strain and drink! Pineapple weed tea is delicious and quite sweet by itself, but it is also amazing if you add a spoonful of honey. Give it a try! 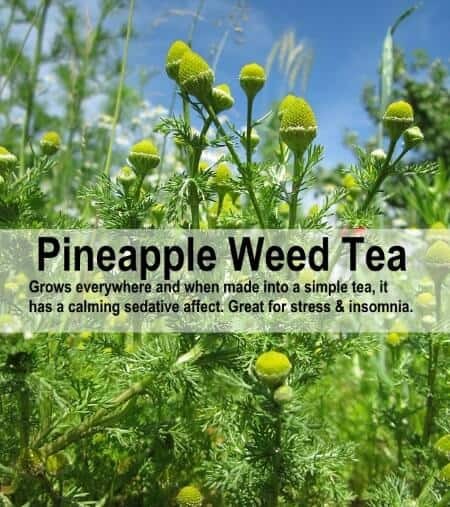 Note: I am not aware of any issues relating to drinking pineapple weed tea and medical conditions or medications, but I am not a medical expert, so just to be on the safe side, check with your doctor if you are suffering from a serious medical condition. I am sure it’s fine but better to be safe than sorry. A while back we featured a post about harvesting and using dandelion roots. The post is very popular, but loads of people have asked about making dandelion wine. As the dandelions are young and tender, and popping up everywhere right now, I thought the timing was right to feature a recipe for dandelion wine. I search long and hard for a tutorial/recipe, and I found an awesome tutorial/recipe on the website ‘Ziolowy Zakatek’ that has amazing photographs together with step-by-step instructions to help you along the way. Get over there and check it out!